Learn How to Become a Better Listener! Become a better listener by using hypnosis to help you develop those specialized skills that turn hearing into listening. Most people do not listen to the best of their ability because they are already thinking about what they will say next once the speaker stops talking. Likewise, when listening to a lecture or something on the radio, we are actually only absorbing a small fraction of the information conveyed. The Art of Listening Hypnosis MP3 is able to help with focus and therefore true listening. Listening has little to do with hearing. Someone with perfect hearing may not be a good listener. Just take a child watching their favorite television show as an example. Their mother may be telling them that when the show is over it is time to brush their teeth and go to bed, but it will not register because, although they heard their mother’s voice, they did not listen to the message. If at that same moment the mother were to offer them a bowl of ice cream, the words would probably sink in and they would have not only heard the sound of her voice, but listened to the content of the message. Hypnosis is able to train the brain to be more receptive to spoken messages. It does this by organizing the clutter that may be circulating in the mind, so that clear channels are opened to receiving communications. It also programs you to make listening more of a priority. In order to listen effectively you cannot have your thoughts on anything but what is being said. Hypnosis helps develop this type of listening ability. 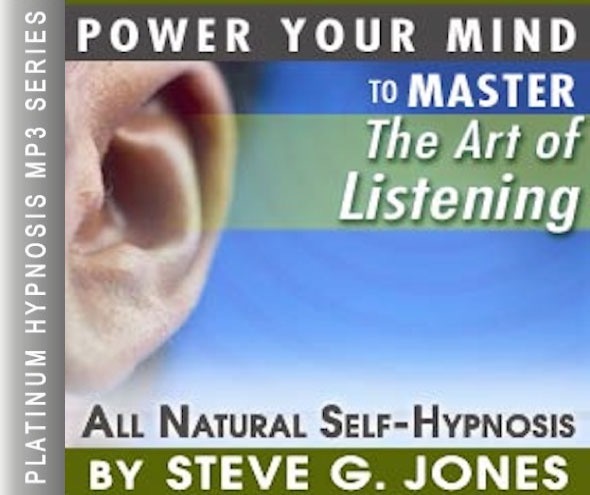 The Art of Listening Hypnosis MP3 session is a self-hypnosis program developed by Clinical Hypnotherapist, Steve G. Jones. By using the program for 21 consecutive nights, you can become a more sensitive and skilled listener. Trigger Your Prefrontal Cortex, the Seat of Good Judgment and Expression! 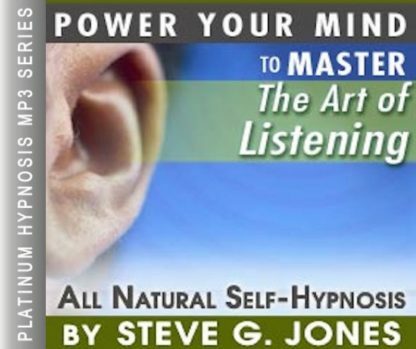 Steve G. Jones takes you to the next level, puts the wind back in your sails, and gets you focused on becoming a better listener – NOW!!! Steve G. Jones, Ed.D., Clinical Hypnotherapist, charges $1,500 for a custom recording and $25,000 for a one-hour private hypnotherapy session at his office. But you can get all the benefits for this low price. Simply listen to the The Art of Listening Hypnosis MP3 recording every night as you go to bed for three weeks and feel the changes happening in your life. You will feel more empowered, more in touch with your true self, and you will truly know that your goals are within your reach. Steve G. Jones achieves AMAZING and LASTING results!!! Hypnosis is the easiest way to affect change in your life because the positive messages go straight to your subconscious mind effortlessly so you can accomplish your goals and reach for the stars!! All you have to do is listen to The Art of Listening Hypnosis MP3 session at night as you go to sleep!!! You’ll hear soft music, the gentle sounds of the beach, and the soothing sound of Steve G. Jones’ voice all working together to bring about positive changes in your life easily and naturally. Steve G. Jones has been helping people improve their lives with hypnosis for over 17 years…now it’s time for him to help YOU… don’t wait, do it NOW !!! you’ll be glad you did. See you at the top! Do people often remind you that they told you something, but you can’t remember? It’s not a memory problem; it’s a listening problem. Listening is more than just opening your ears to sounds. When someone is talking to you, you have to focus on what they are saying. It may take a little practice if you are trying to improve your listening skills, but you can do it! Have you been in a situation where someone is talking to you and then you part ways and then you say: I have no idea what they were saying. It is probably because you were tuning them out and not focusing on what they were saying. It is nothing to be worried about, it is kind of like being on autopilot, but our ears aren’t functioning at 100%. It is important to listen to those around you. Becoming a better listener will open your world to new and better opportunities. There are a lot of people out there with important things to say and they are talking to you for a reason. It is important to focus on what is being said and you can become a better listener! And as you continue to relax deeper and deeper and more deeply relaxed, you realize that you are very tuned into my voice because when people speak you are always tuned in because you are an excellent listener. You are an amazing and wonderful and powerful person and you show respect for yourself. When you show respect for others, when you listen to what they have to say, you show respect for yourself because you want to hear what they have to say because you realize that this may add to your total knowledge, making you a much more knowledgeable person. So you pay attention when others speak. You pay careful attention and you are able to retain the information they give you. You are able to remember what they say. You are an excellent listener. You are an excellent listener. You are an excellent listener. I’d like you now to imagine yourself in a situation where you are listening to someone, that’s right. Notice that you pay careful attention to what they say. And then you speak, they listen to you and then you speak more and they continue listening. And now it is time for you to listen and you eagerly await the opportunity to listen and they speak and you listen attentively. You understand what they say and if you need to ask any questions, you do so because you are an excellent communicator and notice that they are happy that you are listening and you are also remembering what they are saying so that you will be able to recall it later easily and effortlessly because very soon indeed the art of listening will be natural for you. Natural and easy, you are a natural, easy listener. So relax now and realize just how powerful you are. Listening to what others have to say is a very important skill to have. When others talk to you it is important to hear what they are saying and understand it so that you can converse with them. Many people tend to tune people out. Well, hypnosis can get rid of this problem! Hypnotherapy targets your subconscious mind. The Art of Listening Hypnosis MP3 audio is a powerful program that will train you to listen to those around you. You will be instructed to listen to this hypnotherapy session for 21 nights in a row before going to bed. You will hear the relaxing voice of Steve G. Jones giving you suggestions to become a better listener. Many people start seeing results right away! They notice that they are more in tune with what other people are talking about. They feel as though their ears are listening at all times. They are better able to converse with people of all sorts of different backgrounds. The Be a Better Listener Hypnosis recording will make you tune into the world around you and enable you to interact with others at the highest level. Being a Better Listener is a skill that everyone should work on. This self-hypnosis MP3 is a powerful program that will strengthen your ability to listen. After 21 nights of listening to this recording, you will notice that you have a heightened sense of hearing. You will be able to tune into people better, whether they are a spouse, child, colleague, or acquaintance. Your subconscious mind is in charge of your listening ability. If you feel like you need to improve your listening skills and be a better listener, then this hypnosis program is for you. Hypnotherapy targets your subconscious mind so that you are in charge of becoming a better listening. This Art of Listening Hypnosis MP3 program will target your subconscious mind to improve your listening skills. Hypnosis and lateral cerebral function as assessed by dichotic listening, Crawford, Helen J.; Crawford, Kim & Koperski, Ben J. (1983). This study replicated the results of a previous study, to show hypnotism increases dichotic listening which is a psychological test commonly used to investigate selective attention within the auditory system (Biological Psychiatry, 18 (4): 415-427).